If you’re not utilizing the power of YouTube Marketing then you’re doing your business a massive disservice. Video is the most consumed content in the world with billions of hours of videos being watched daily by hundreds of millions of users. YouTube had made such an impact in the world that people are choosing to watch videos as opposed to reading content. Not only is it faster and more convenient than reading but it’s as easy as hitting the play button. Many marketers are successfully using YouTube to grow their businesses and their brands. Google especially ranks YouTube very highly in their search results with a good mix of article content and video content rounding out the search results. Knowing this, it’s definitely a very good idea to be creating and optimizing your video content for YouTube. Even more importantly, people are using YouTube for answers and solutions just as much as they’re using Google and Facebook. If you haven’t figured out the importance of YouTube, this guide is the one you need. You will learn how to douse rocket fuel on your business through YouTube and set it on fire. You’ll learn about creating powerful marketing campaigns, getting your content seen by millions, driving traffic and converting them into buyers and subscribers, building your brand and much more. The journey starts here so grab this guide now. 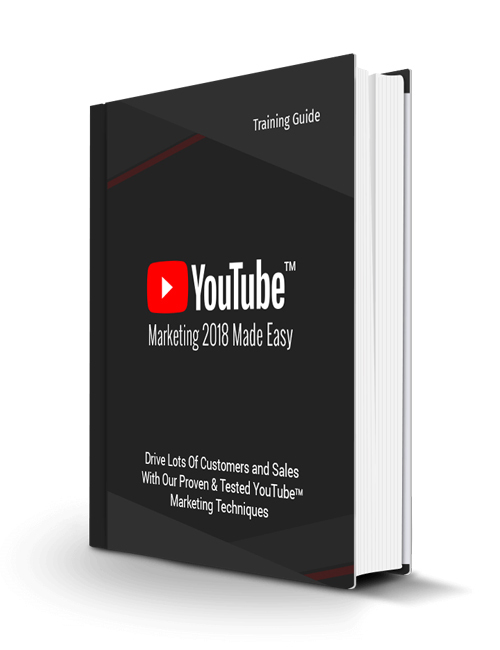 You can also get the YouTube Marketing 2018 Made Easy video course if you prefer visual learning. Get it now.